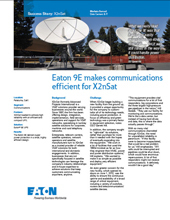 X2nSat needed to achieve high reliability with an efficient and compact UPS. The Eaton UPS delivers super power protection in a small, highly efficient design. X2nSat had a unique opportunity to custom-tailor its technology needs when it began building a new facility.Efficiency, green technology and continuous uptime were the primary factors in selecting the right power protection. With so many vital communications channeled through the company, the need for unparalleled reliability is paramount. The Eaton 93E ensures maximum availability, helps the company meets its green goals with a design that yields up to 98 percent efficiency and facilitates a low total cost of ownership through energy efficiency, internal batteries and a compact footprint.